We’re hosting a Halloween kids art contest for kids up through age 15 and would love to showcase your child’s masterpiece! We will choose up to three entries that will be featured on our website throughout the day of Halloween, Friday, October 31st. 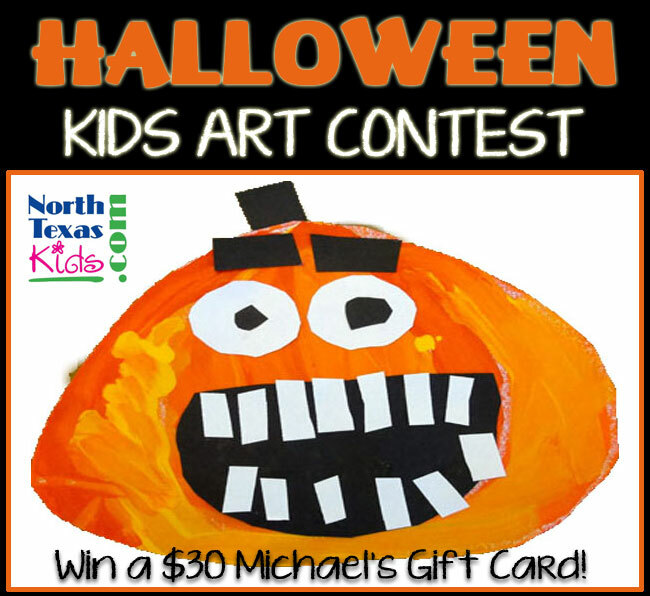 In addition to having their art featured on our website, first place winner will also receive a $30 Michael’s gift card. All winning art and artist names will be posted to our social media pages via announcements. Contest is open to kids up through age 15. Art should be an original Halloween themed piece by artist. Can be drawing, painting, craft or paper mosaic. Submissions accepted electronically. Deadline to submit artwork is Wednesday, October 29, 2014 by midnight CST. Please email an 8 1/2″ X 11″ scan of drawings/paintings or high res photo of the craft/paper mosaic to editor@northtexaskids.com. Please use Halloween Art Contest in subject. Do not put child’s name on the front of the art, but please include your child’s name and age, and a name for the art work, if applicable, in your email. Thanks, and good luck! We can’t wait to see and share your children’s creativity!